The Palestinian Health Ministry in Gaza has reported that a young man died, on Saturday at dawn, from serious wounds he suffered Friday, east of the al-Boreij refugee camp, in central Gaza. 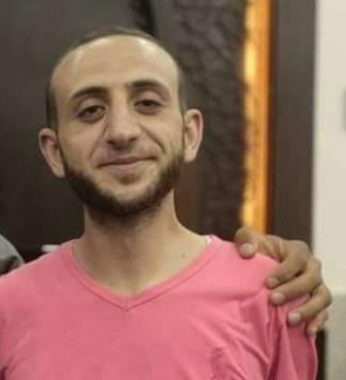 It said that the Palestinian, identified as Mojahed Ziad Zaki Aqel, 23, died from his serious wounds at the Al-Aqsa Hospital in Deir al-Balah, in central Gaza. He was shot, east of the al-Boreij refugee camp in central Gaza, during Friday’s Great Return March processions, in which the soldiers killed four Palestinians, and injured 232 others, including 180 who were shot with live fire. The soldiers also shot eight paramedics while providing the needed medical aid to wounded Palestinians in protest areas, in addition to 51 children, eight women in the eastern parts of the coastal region. On Friday evening, the soldiers invaded the al-Mazra’a al-Gharbiyya village, northwest of the central West Bank city of Ramallah, killed one Palestinian, identified as Othman Ahmad Ladadweh, 33, and injured dozens, including eight who were shot with live fire, while the soldiers also assaulted journalists, and shot one.